Quality handcrafted jewelry can be a special place for memories. 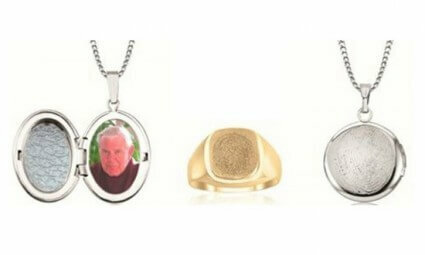 You will find following a selection of our extensive Sterling Silver, 10k and 14k White/Yellow Gold, Surgical Stainless Steel and Gold Accent cremation jewelry. In many cases we can custom design pendants and bracelets on request. Prices do not include shipping or tax. Extra charges may apply. Contact your funeral director for further details. The only “patent pending” process to digitally capture, transfer and create an exact replication of a persons fingerprint. This Collection of custom designed pieces resonate with their owner, to create a deep emotional connection – a constant reminder of the bond shared with a loved one. Each piece creates a legacy for generations to come.